Follow the “Stubblefield & Hansen” guitar duo on Spotify! The debut EP goes live on Spotify on February 26th, 2019! Please click on the “FOLLOW” Button! Stubblefield & Hansen digital EP coming this February! The EP will be available on all digital platforms worldwide. More details coming soon! Follow Jim on Pandora and Spotify. You can create a “Jim Stubblefield Radio” station on Pandora and follow Jim on Spotify to hear his music in your car, home or office! Guitare Mystique wins UK award for Best Acoustic Guitar Album! Remember you can always listen to Jim’s music on Pandora, Apple Music, Deezer and Spotify! 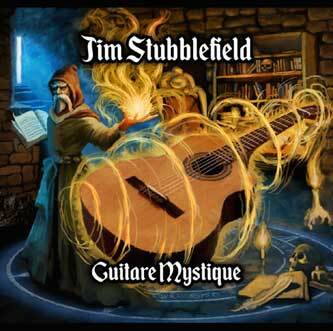 "In 2015, guitarist / composer Jim Stubblefield released his album Encantado and in 2017 he returns with Guitare Mystique. Purposely spelled in a mystical way, the ten track album takes on a wide range of musical styles, including a kind of ancient-sounding approach to the magical guitar. Guitare Mystique picks up on the approach of Encantado as well as Jim’s work with the band Incendio, yet there’s more new ground broken here. Using the Contemporary Instrumental sound as a jumping off point, there’s a range of inspired-sounding guitar genres explored, including a slightly gothic or even medieval sort of sound. For example, the addition of strings on track seven “Moonlight Requiem” gives the track a sort of modern neoclassical sound, kind of Electric Light Orchestra sans vocals, if you can imagine. Track nine, “Rumba Furiosa, Opus 2” features Jim supported by the daredevil electric guitar work of guitar ace Dan Sistos. Jim has chosen a remarkable bunch of musicians to help execute his sound on Guitare Mystique, including co-producer and album mixer Bo Astrup, guitarists Stephen Duros, Dan Sistos (mentioned above) and Eric Hansen, bass ace Randy Tico, drummers Ramon Yslas and Bryan Brock as well as Moksha Sommer (vocals) and Novi Novog (strings). The CD sound is first rate and the album artwork is colorful and quite imaginative, all adding to the sense of fun and excitement. Guitare Mystique takes the entire 21st century Contemporary / World Fusion instrumental guitar sound to new heights. Start to finish, Guitare Mystique is clearly the most well-rounded album yet from the imaginative, guitar-centric mind of Jim Stubblefield." Follow Jim on Spotify to listen to his new album and see his custom playlists. GUITARE MYSTIQUE is now on SPOTIFY! Spanish Guitar meets Electric Guitar! "Puesta del Sol" from the CD "Encantado" is featured on a CD that comes with the March 2016 issue of Acoustic Magazine! Also, check out the sheet music tab on this site for a free download of the note-for-note transcription of the piece. Jim was interviewed for the January 2016 issue of the Austin-based Sound Profile Magazine. Encantado debut's at #2 on One World Radio UK chart & #3 on ZMR aggregate chart! One World Music UK did a wonderful retrospective of my music. For those interested, they did several broadcasts that feature a lot of early recordings - some that go as far back as 1997! These shows are all archived at this link. I just found out that my latest album, ENCANTADO, is in the first round of the 2016 GRAMMY AWARDS balloting. NARAS members please check it out and consider it! Also, new guitar NOTATION/TABS (transcribed by Eric Hansen) are here. ENCANTADO is now a best seller on Amazon. Incendio's 8th CD set for late June 2013 release! SHOW SUMMARY: Tonight we talk to extraordinary guitarist Jim Stubblefield, of Incendio, about his sound, his technique, and his expanding of musical colors by incorporating electric guitar into his solo efforts and the upcoming Incendio album. We also play clips from his solo album "Inspiracion" and his just released single "Reaching for Infinity," which features an electric guitar solo! Jim Stubblefield "Mobile App" Now available for Android! Check out the Mobile App by Jim Stubblefield. This free Mobile App lets you listen to music, check out photos and videos, read blog posts and get exclusive push notifications straight to your mobile device. New Single - "Reaching for Infinity"